Geneva Airport, situated in Cointrin, is a major international airport serving the city of Geneva. Sitting close to the border with France, this airport serves the citizens of both France and Switzerland. Geneva Airport has come a long way since 1919, beginning as a simple field with wooden sheds. Today, it is one of Switzerland’s busiest airports. Geneva Airport (IATA code: GVA) is the second-busiest airport in Switzerland and the hub for Adria Airways and EasyJet Switzerland. Flights to Geneva Airport are provided by international airlines such as Air Canada, Alitalia and El Al. GVA is a 15-minute drive or a 10-minute train ride from the city centre of Geneva. Book your cheap flights to and from Geneva Airport online! Geneva Airport, situated close to Lake Geneva and the border with France, provides the gateway to exploring the beautiful country of Switzerland. Since its beginnings in 1919, the airport, alternatively known by its former name of Cointrin Airport, continually expanded, increasing its capacity to handle bigger aircraft. Today, Geneva’s international airport continues to grow, as does its passenger count. By 2030, the airport’s officials predict that the airport will welcome around 25 million travellers through its doors. You’ll be sure to have a wonderful time at Geneva Airport with its continual increase in facilities, ensuring that travelling to Geneva will be a pleasure. 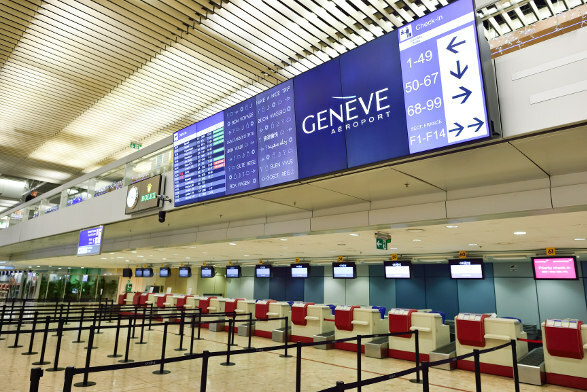 When you have some time to spare at Geneva’s airport, go window shopping or get all your essentials at the various retail outlets, including duty-free shops. Products on sale at these establishments include fashion, accessories, cosmetics, jewellery, souvenirs, flowers, gifts, books, newspapers, electronics, treats and snacks. Take care to observe the baggage restrictions when you’re at Geneva Airport. A pharmacy is available in the departure public zone for any minor health concerns you may have. This airport additionally features a large number of restaurants, bars, tea rooms, cafés and fast food outlets. Enjoy the great selection of meal options to ensure you continue to have a relaxing and satisfying time at Geneva Airport. A collection of lounges is available around Geneva Airport, operated by the airlines of Air France, British Airways, Swiss International Air Lines and the aviation services of dnata and Swissport. These lounges include working spaces, luxurious furniture and a kitchen with a diverse menu. You will need to make a booking on the airport’s website to reserve one of these lounges. Other facilities that you can make use of at the airport include services for disabled travellers, priority lanes (allows quicker access, must be purchased), free Wi-Fi (for 90 minutes), banks, currency exchange, post offices and business facilities. Campanile Geneve - Ferney-Voltaire This beautiful 3-star hotel in France is a 5-minute drive from Geneva Airport. It includes a restaurant, breakfast, 24-hour front desk, daily housekeeping and garden. Additionally, guests have access to free newspapers in the lobby, free Wi-Fi and free parking. Nash Airport Hotel This large 4-star hotel is a 10-minute train ride from the airport. Features include a restaurant, bar/lounge, 24-hour health club, 24-hour business centre, terrace, air conditioning and a garden. Free Wi-Fi and free airport shuttles are available as well. Movenpick Hotel & Casino Geneva This 5-star luxury hotel is a 5-minute drive from Geneva’s airport. Its large number of amenities comprise of a fitness centre, 24-hour business centre, 24-hour front desk, air conditioning, daily housekeeping, laundry service, conference space and 2 restaurants. Free Wi-Fi and free airport shuttles are also available. Make sure to order your foreign exchange 60 days before collection. Collection of foreign exchange orders can only be done in person. Swiss Railway Counters are available at the Railway Station, while Global Exchange offices are situated in the departure public zone and in the arrivals area. Geneva Airport includes a multi-storey car park, with parking spaces available for short and long-term stays. Valet services are offered as an added convenience. You can book one of these parking spaces on the airport’s website. Geneva Airport sits 4 km to the northwest of Geneva’s city centre. Taxis, trains, trams, buses, boats, shuttles, Uber and car rental options are available to get you from the airport to your destination.